Chanteur Rock 'n' Roll US né le 10 Septembre 1925 à New Orleans (Louisiane). 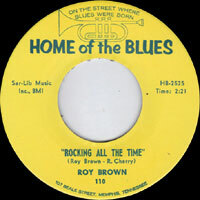 Roy Brown, à la voix puissante et haut perchée, est l'un des grands précurseurs du Rock 'n' Roll. 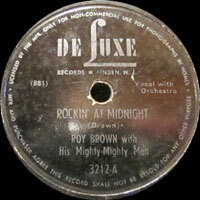 Il obtient en 1947 un succès considérable avec "Good Rockin' Tonight" qui sera repris par beaucoup de chanteurs et qui deviendra un classique du Rock 'n' Roll. Eliminé par les pionniers du Rock et négligé par les revivalistes. 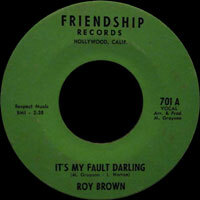 Roy Brown est mort le 25 Mai 1981 à San Fernando (Californie). 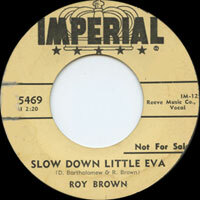 When you draw up a short list of the R&B pioneers who exerted a primary influence on the development of rock & roll, respectfully place singer Roy Brown's name near its very top. 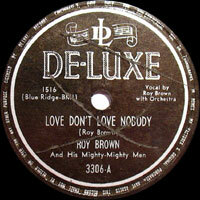 His seminal 1947 DeLuxe Records waxing of "Good Rockin' Tonight" was immediately ridden to the peak of the R&B charts by shouter Wynonie Harris and subsequently covered by Elvis Presley, Ricky Nelson, Jerry Lee Lewis, and many more early rock icons (even Pat Boone). 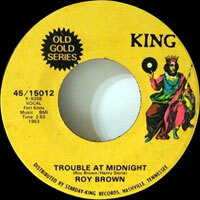 In addition, Brown's melismatical pleading, gospel-steeped delivery impacted the Vocals styles of B.B. King, Bobby Bland, and Little Richard (among a plethora of important singers). 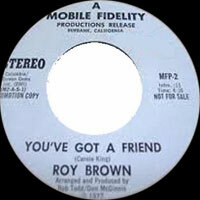 Clearly, Roy Brown was an innovator — and from 1948-1951, an R&B star whose wild output directly presaged rock's rise. Born in the Crescent City, Brown grew up all over the place: Eunice, LA (where he sang in church and worked in the sugarcane fields); Houston, TX; and finally Los Angeles by age 17. Back then, Bing Crosby was Brown's favorite singer — but a nine-month stint at a Shreveport, LA, nightclub exposed him to the blues for the first time. He conjured up "Good Rockin' Tonight" while fronting a band in Galveston, TX. 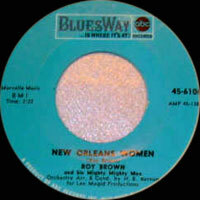 Ironically, Harris wanted no part of the song when Brown first tried to hand it to him. 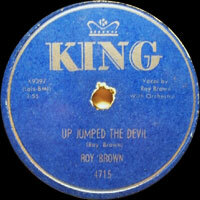 When pianist Cecil Gant heard Brown's knockout rendition of the tune in New Orleans, he had Brown sing it over the phone to a sleepy DeLuxe boss, Jules Braun, in the wee hours of the morning. 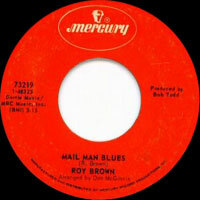 Though Brown's original waxing (with Bob Ogden's band in support) was a solid hit, Harris' cover beat him out for top chart honors. 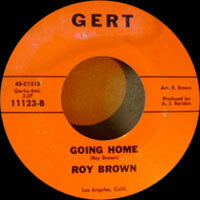 Roy Brown didn't have to wait long to dominate the R&B lists himself. 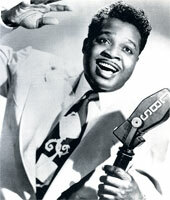 He scored 15 hits from mid-1948 to late 1951 for DeLuxe, ranging from the emotionally wracked crying blues of "Hard Luck Blues" (his biggest seller of all in 1950) to the party-time rockers "Rockin' at Midnight," "Boogie at Midnight," "Miss Fanny Brown," and "Cadillac Baby." 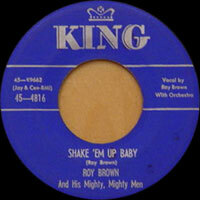 Strangely, his sales slumped badly from 1952 on, even though his frantic "Hurry Hurry Baby," "Ain't No Rockin' No More," "Black Diamond," and "Gal From Kokomo" for Cincinnati's King Records rate among his hottest house rockers. 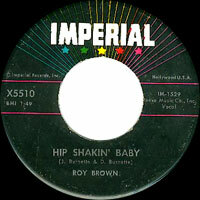 Brown was unable to cash in on the rock & roll idiom he helped to invent, though he briefly rejuvenated his commercial fortunes at Imperial Records in 1957. 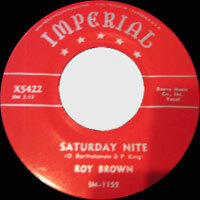 Working with New Orleans producer Dave Bartholomew, then riding high with Fats Domino, Brown returned to the charts with the original version of "Let the Four Winds Blow" (later a hit for Domino) and cut the sizzling sax-powered rockers "Diddy-Y-Diddy-O," "Saturday Night," and "Ain't Gonna Do It." 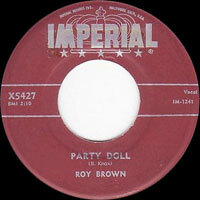 Not everything was an artistic triumph; Brown's utterly lifeless cover of Buddy Knox's "Party Doll" — amazingly, a chart entry for Brown — may well be the worst thing he ever committed to wax (rivaled only by a puerile "School Bell Rock" cut during a momentary return to King in 1959). 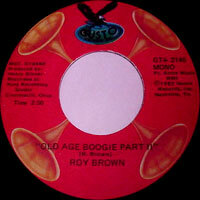 After a long dry spell, Brown's acclaimed performance as part of Johnny Otis' troupe at the 1970 Monterey Jazz Festival and a 1973 LP for ABC-BluesWay began to rebuild his long-lost momentum. 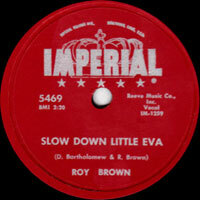 But it came too late; Brown died of a heart attack in 1981 at age 56, his role as a crucial link between postwar R&B and rock's initial rise still underappreciated by the masses.